What are the Technical Specifications and Features of the Razer Raiju Mobile? How do I connect the Razer Raiju Mobile to my Android phone? You can connect your Razer Raiju Mobile to your Android phone using the USB-C cable included in the package, or Wireless via Bluetooth. Are all phone sizes supported by its phone grip? Although designed to fit most Android phones, the phone grip only supports phones of up to 79 mm (3.11 in) in width. How do I connect the Razer Raiju Mobile to my Android phone using the USB-C cable? Set the Raiju Mobile mode to USB. With your phone placed in the phone grip, connect your phone to the controller using the USB Type-C to USB Type-C cable. The status indicator will turn green indicating that the controller is now ready to use. How do I wirelessly connect the Razer Raiju Mobile to my Android phone? Set the Raiju Mobile mode to either BT1 or BT2. Power ON the Raiju Mobile by pressing on the Home button until the status indicator starts to blink blue. Press and hold both the HOME and START buttons until the status indicator starts to blink in white to activate pairing mode. On your phone, open its Bluetooth settings, and select Razer Raiju Mobile from the list of available devices. Wait until the status indicator becomes solid blue indicating that the pairing was successful, and the controller is now ready to use. How do I clean my Razer Raiju Mobile controller? We cannot say with certainty what type of dirt and debris may be on your product, or how certain cleaning products may react with it, but we have had good luck cleaning Razer products using commonly available monitor cleaning wipes. To clean the body of your Razer controller, please take a monitor wipe and use gentle wiping motions. Do not scrub the surface of your Razer controller. How do I customize the button functions on my Razer Raiju Mobile? You can customize your controller’s button functions, mappings, and other features using the Razer Raiju Mobile app. Simply download the mobile app on your mobile device, launch the app, and follow the onscreen prompts and instructions. How long does it take to fully charge the Razer Raiju Mobile? It takes approximately 4 hours to fully charge your Razer Raiju Mobile. I broke the retractable phone grip on my Razer Raiju Mobile, can I buy a replacement? No, the phone grip is part of the Raiju Mobile controller. It cannot be replaced. Can I use the Razer Raiju Mobile controller with my PC and where can I find the drivers? Yes. The Razer Raiju Mobile can be used with a PC running Windows 7 or later. Please download and install the driver here. Can I use the Razer Raiju Mobile with the Razer Forge TV or any other Android TV? Yes, the Razer Raiju mobile can be used with an Android TV that has Bluetooth connectivity. There is, however, no dedicated android TV app for configuration of the controller, and it would be best to configure the controller using your phone. Can I remove the retractable phone grip? No, the retractable phone grip of the Razer Raiju Mobile is part of the controller and cannot be removed. Can I adjust the sensitivity of the Razer Raiju Mobile joysticks? Yes, you can adjust the sensitivity of the joysticks using our mobile configuration app. Can I change the joystick handles on my Razer Raiju Mobile? No, the joystick handles on the Razer Raiju Mobile are fixed and cannot be changed. I broke the buttons/joysticks on my Razer Raiju Mobile, can I buy spare parts? No, the buttons/joysticks are part of the Razer Raiju mobile controller and we do not have spare parts available. Please contact support if these are broken during the warranty period. What is the minimum required Android OS version of the Razer Raiju Mobile? Android 6.0 or higher will work with the Razer Raiju Mobile. Is the Razer Raiju Mobile compatible with iOS? No. Razer Raiju Mobile will only work with Android OS. The Raiju Mobile app will also only be available from the Google Play Store. Can I connect multiple Razer Raiju Mobile controllers to an Android TV? Connecting multiple devices is dependent on the Android device. If the device can accept multiple concurrent Bluetooth clients, it will be possible to connect multiple Razer Raiju Mobile controllers. Do I need the Raiju Mobile app in order to use the Razer Raiju Mobile? You can plug and play the Razer Raiju Mobile controller to an Android device and utilize the default settings. The Raiju Mobile app can be used to configure the controller’s button mappings and thumbstick sensitivities (no vibration settings) if you want to change their default settings. Can I use a universal micro USB cable / charger to charge the Razer Raiju Mobile? The Raiju Mobile controller can be charged with any compatible USB-C cable. Razer does not take responsibility for any damage that occurs as a result of using a defective USB-C cable. How can I disable/remove the multi-function buttons M1/M2/M3/M4 on the Razer Raiju Mobile? You can unassign the button mappings of the multi-function buttons using the Raiju Mobile app. After connecting to the Raiju app, simply choose the multi-function button you wish to disable, and select unassign in the remapping menu. How do I know the Razer Raiju Mobile is charging? The controller takes about 4 hours to be fully charged. In Bluetooth mode when the controller is powered off, the status LED will light up red when the controller is charging and go off when it is fully charged. Is the Razer Raiju Mobile Bluetooth 5 compatible? Yes, the Razer Raiju Mobile is compatible with Bluetooth 5 host devices. How do I remove a paired Razer Raiju Mobile from Raiju app? You can simply cancel the connection to the controller in the Raiju Mobile app. You can then select "Add New Controller" to connect the app to another controller. Alternatively, when connected to the controller from the Raiju app, tap on the app menu and select Switch Controller. My Razer Raiju Mobile lags when it’s connected to the mobile app. What should I do? When not configuring the Razer Raiju Mobile, please close the Raiju app on your mobile device. How long can I use the Raiju Mobile until I have to charge it again? Depending on usage, the Raiju Mobile battery life can last up to 23 hours from a full charge. Can I place my phone horizontally or vertically on the phone mount of the Razer Raiju Mobile? The phone mount on the Razer Raiju Mobile is meant for Landscape (Horizontal) mode only. The USB mode does not work on my OnePlus phone and the Razer Raiju Mobile. What should I do? 1. Open the Settings app on your OnePlus phone. 2. In the search bar, type “otg”. 3. Tap on the OTG storage search result. 4. Toggle on the OTG storage option. The OTG storage option will be disabled automatically after 10 minutes of inactivity in case you forget to turn it off. To use it again, you have to turn it on using the steps above. Will my phone charge the Razer Raiju Mobile if connected using a USB-C cable? Yes, your phone will charge the Razer Raiju Mobile if connected using a USB-C cable. Will the Razer Raiju Mobile work with emulators? The Raiju mobile will work with game emulators that support standard android game controllers. My game does not work with the Razer Raiju Mobile, what can I do? The Razer Raiju Mobile supports standard Android controllers. 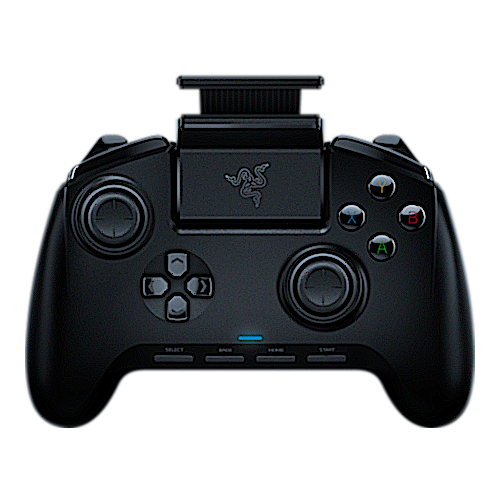 If the game developer did not provide standard controller support in the game, the Razer Raiju Mobile cannot be used. You may wish to contact the developer of the game and ask them to support standard Android controllers. We hope the developer will see the demand for Android Controller support and release more games that are supported. What is the battery capacity of the Razer Raiju Mobile? The battery capacity of the Razer Raiju Mobile is 1500 mAh. What games will work with the Razer Raiju Mobile? Here's a list of apps that support Android Game Controllers and are generally compatible with the Razer Raiju Mobile. Based upon tests performed internally at Razer, the titles indicated with an asterisk* are fully compatible with the Razer Raiju Mobile. This list is dated December 2018, however, new titles are being added all the time and other titles may be supported.